There are credible sources galore that give a true voice to the book that range from “Greek God” Papadon and Jim Cornette to Ring Of Honor COO Joe Koff and Adam Cole. That’s not to say the territories chapter doesn’t read like “Let’s just get to the Monday Night Wars already” and then the WWE/World Championship Wrestling (WCW) war is essentially skipped over and it’s straight to 2002 when Total Nonstop Action Wrestling (TNA) and Ring Of Honor (ROH) form with unsure futures. We’ll give credit where its due – things like the misconception that because one indie company does a crappy show that all independent wrestling is like that is strongly addressed. They remind us that anybody who can afford a ring and a promoter’s license can run a show despite no prior experience. The book’s strong point is the overview of various talent who aspired to make it to WWE as well as those who did, but weren’t cut out for the tedious lifestyle. The chapter that focuses on James Ellsworth and his rise to a full-time contract all from how he was received on the internet in a match against Braun Strowman is delicately detailed. The same can be said for the Cody/Young Bucks/Stevie Richards/Mike Mondo chapter, with examples of current name value based on past experience and marketing abilities. Succeeding without WWE is possible more so than ever. The ROH chapter is also a highlight, as we get a sense of how the company runs their business model on “taking their time” not to catch WWE and a focus on in-ring performances with dashes of entertainment like Dalton Castle. Why ROH should be a focal point is because of its influence on the current WWE roster (Daniel Bryan, Cesaro, Kevin Owens, Seth Rollins, etc.) and while it would’ve been a gold mine to get one of those guys as sources, we’ve heard their story elsewhere before. Needless to say, it’s still the book’s backbone. What strongly hurts this release is the amount of spelling/grammar errors like “ultimately” (p. 6) and “possibly” (p. 74), as well as Finn Balor spelled as “Baylor.” Sasha Banks was also erroneously referred to as the first WWE SmackDown Live Women’s Champion when it was in fact Becky Lynch. Snyder – who has reported on things from 9/11 to the National League Football playoffs and multiple elections – has credibility in the field, but even the most casual fans will roll an eye at what he tries to argue with those silly mistakes. Did the editor even look at this? We were also disappointed that in the “Women’s Revolution” chapter, despite its look into talent like Kennadi Brink and Mandy Leon among ROH’s Women Of Honor promotion, the highly influential Gail Kim-Awesome Kong feud of TNA fame is nowhere to be mentioned. The two ladies helped put the company on the map and even main-evented a few times, 8-9 years before Banks and Charlotte Flair graced the spotlight. For its extensive investigation in aspects of the current independent wrestling business and how it came to be “digitalized,” it also throws us off when chapters are chronologically unorganized. We could go from 2002 in one chapter to 2016 in the next and back to 2006 the next. They’re all different times in the business. There’s no flow, so it feels like just when we get the hang of things, we’re shaken upside down. Is “Wrestling’s New Golden Age” a tried-and-true testament to what independent wrestling is today? You could say that, but there were times that it felt like a breakthrough feature piece and others where it was just an overdrawn essay on pro wrestling. The lack of balance doesn’t deter the objective however, it’s just more of a nuisance. In the end, it’s a winner, but by botched interference. 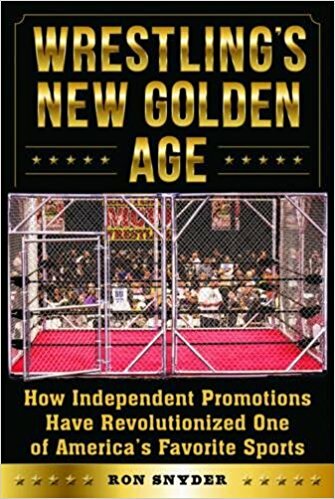 Not exactly a smooth read, but informative and chockfull of credibility from those who count the most here – the voices of independent wrestling – veterans, rookies and promoters. It’s a thorough history lesson through and through. Posted on December 12, 2017, in Misc and tagged Adam Cole, Awesome Kong, Becky Lynch, Book Reviews, Cesaro, Charlotte, Colt Cabana, Daniel Bryan, Finn Balor, Gail Kim, Independent Wrestling, James Ellsworth, Jim Cornette, Joe Koff, Kennadi Brink, Kenny Omega, Kevin Owens, Mandy Leon, Mike Mondo, Opinions, Pro Wrestling, ROH, Ron Snyder, Sasha Banks, Sports Publishing, Stevie Richards, The Young Bucks, TNA/Impact Wrestling, WCW, WWE. Bookmark the permalink. Leave a comment.